As we approach mid 2013, marketers are considering changing their social media marketing mix. While about half of marketers view Facebook as the most important social media platform, they recognize that a mix of social media venues is critical for maximizing business results. Based on Social Media Examiner’s 2013 State of Social Media Report, here are the top ten social media platforms where marketers plan to increase usage through 2013. 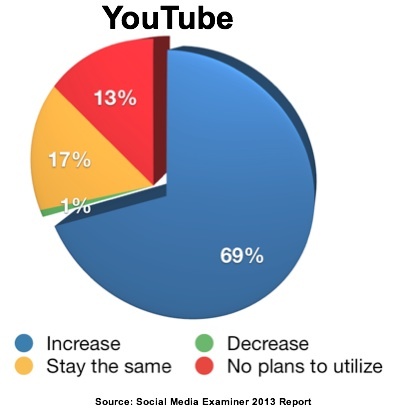 Almost seven out of ten marketers plan to use YouTube, down from 76% in 2012. YouTube is often missed in social media statistics since many of the major analytics firms consider it to be a video site. In addition to being the number two social media site, YouTube is the second largest search site after Google. (Yes you read that correctly!) Therefore, you should have a presence on YouTube to support your business and search strategy. Create a set of three to five videos since if viewers like your video, they’ll look for more. Optimize your videos for search. 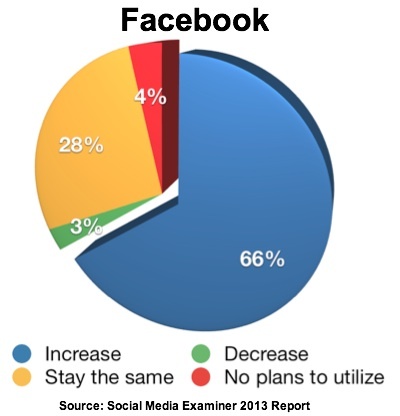 Two-thirds of marketers plan to increase Facebook use. As the 800 pound gorilla of social media, Facebook is a must-have in any social media marketing portfolio. Currently 92% of marketers use Facebook. Bear in mind that in some parts of the world, Facebook may be the only social media platform. Test Facebook’s expanded advertising options to support your marketing goals. In Jon Loomer’s words, Facebook allows an incredible level of micro-targeting. 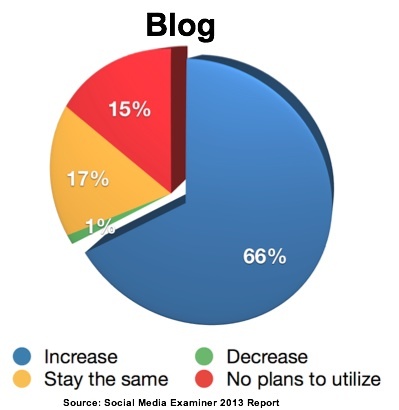 Two-thirds of marketers plan to increase their use of blogs. The rationale for this investment is the fact that unlike the other social media options, blogs provide an owned content platform – specifically, blogs created on your business’s URL. Size matters since blogs can level the playing field. As a result, about seven out of ten small businesses plan to increase their blogging activities. Further, B2B marketers are more likely (71%) to increase blogging activity relative to B2C marketers (62%). This makes sense since B2B products and the related sales process tend to be more complex, requiring more explanation. Blogs provide other advantages over other social media choices. They support search optimization directly through the use of internal and external links. They also fuel the conversation by offering fresh content. Social sharing buttons enable you to acquire earned views. You can encourage interactivity via your blog’s comments. Create fresh blog content on a regular basis to build your audience. Hubspot recommends posting at least twice a week to get 70% of the results of posting multiple times a day. 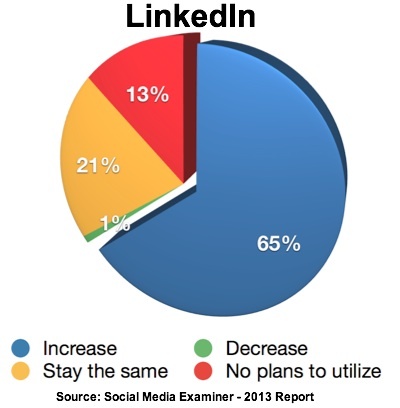 About two-thirds of marketers plan to increase their use of LinkedIn. While companies of all sizes use LinkedIn, it’s a sweet spot for B2B marketers who use it at a rate of almost 80%. It’s great for building relationships with prospects, customers, influencers, experts, suppliers and distributors. Don’t overlook, LinkedIn’s sister site, SlideShare. While it wasn’t included in Social Media Examiner’s report, it’s gold for B2B organizations to attract qualified leads. Despite its name, SlideShare can handle any content format including presentations, infographics, images, videos and other. Take advantage of LinkedIn’s cost effective talent acquisition. LinkedIn topped the Inc 500 list of social media sites for its ability to cost-effectively support employee hiring. 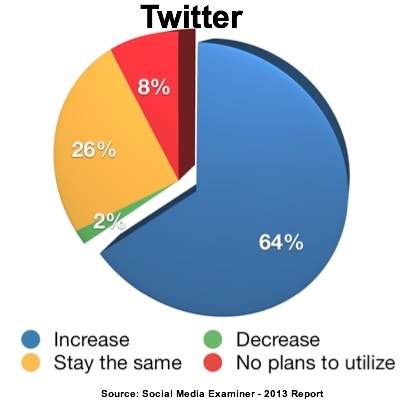 Slightly less than two-thirds of marketers use Twitter. It’s a useful platform for curating news, monitoring important keywords and engaging with prospects. Marketers take note: Twitter has been gaining among the teen demographic. Almost one out of four teens that participate on social media use Twitter according to Pew Internet Report. But Twitter’s reputation has been tarnished lately due to issues with fake or fraudulent followers, most notably the AP. According to two Italian security researchers, Andrea Stroppa and Carlo De Micheli, there are now over 20 million fake Twitter accounts. Build your Twitter following slowly and legitimately. Leverage your owned media to encourage Twitter engagement. Ask readers to share your content on Twitter by using the ClickToTweet button. Slightly more than half of respondents plan to expand their Google+ presence. More interesting is the fact that slightly more than one quarter of respondents have no plans to use Google+. While this platform was at the top of everyone’s list last year for expanded engagement, it’s dropped in importance. 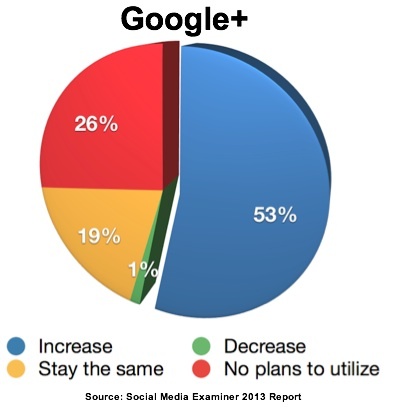 Based on the changes in social media usage, this makes sense, but under estimate the power of Google+ at your risk. Build your presence on Google+ before you find yourself behind your competitors. Use this time to test its special features. Also, don’t forget to claim your Google authorship. 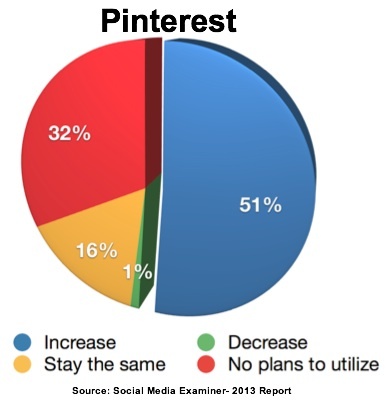 About half of respondents plan to use Pinterest. It’s surprising that this proportion isn’t larger given Pinterest’s meteoric growth in 2012. Think social media eye candy. While the research showed a tendency towards women and consumer-oriented businesses, Pinterest’s base has diversified as it’s grown. In other words, don’t write Pinterest off even if you’ve got a B2B focus. Set up pinboards related to your five to ten categories. Curate relevant visual content for your customers and followers. Also, show a personal side of your business or brand. 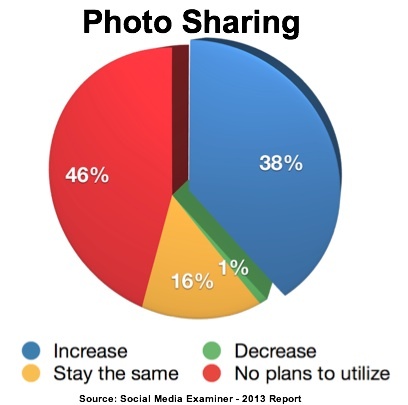 Just less than two out five marketers use photo sharing sites. This group skews towards younger and consumer-foucsed marketers. This is where they put their Instagram plans. But don’t overlook Flickr, where Maryssa Miller of Yahoo is placing resources. People comprehend visual information faster than text. The combination of mobile devices and social media platforms make leveraging the power of images easier, cheaper and quicker than ever before. 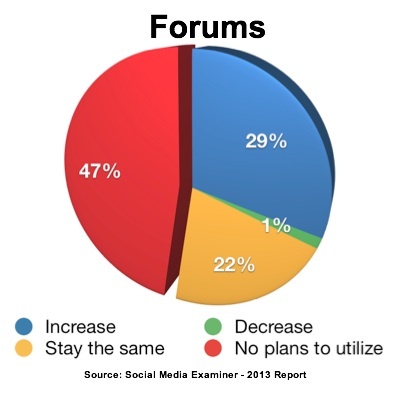 About three out ten marketers plan to increase use of forums, while over half don’t plan to use them at all since many products don’t need the support that a forum provides. You can create a streamlined forum with BBPress on your blog. But so can your detractors, as has happened to Starbucks. Leverage the power of existing forums in your category such as FlyerTalk, Ravelry or TripAdvisor. Focus your participation on helping customers and others, not promotion. 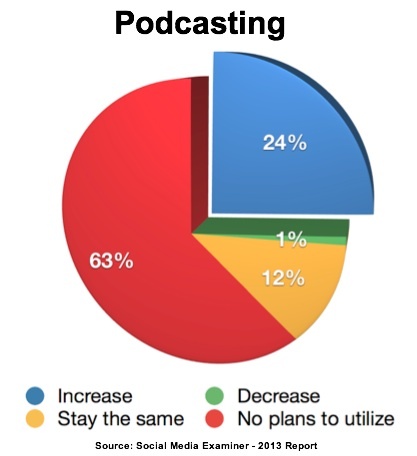 Almost a quarter of marketers plan to podcast this year, a significant increase above the current 5% usage. While not new, podcasting is building a following of content creators because it’s less expensive and easier to create than video. Also, audio has the advantage of being great background content tailored for an audience of one. 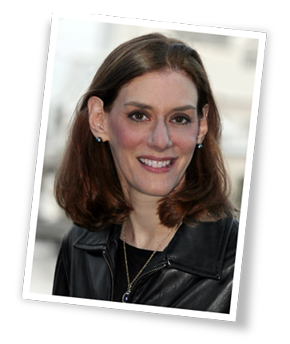 “If you’re looking for a green field of opportunity, examine podcasting. It’s one of the least used platforms by marketers. This represents a significant opportunity to capture a new and relatively untapped audience of more than a billion mobile users.” Mike Stelzner, Founder and CEO Social Media Examiner. Unfortunately, it’s difficult to track podcast results. 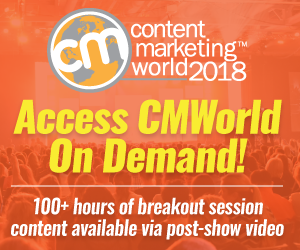 Test the social media audio waters by being a guest on a show in your segment. Be a guest on a podcast. Outline your content before you record to ensure that you’re offering amazing content. What’s missing from this list? Most notable is Tumblr that Yahoo recently purchased. While Tumblr works well for the under-25 set, many marketers haven’t tested this social media platform that’s been part of Nielsen’s top social media platforms since 2011. Test Tumblr’s highly visual microblogging platform to expand your social media presence. Think visual blogging. Make your posts show, not tell. Where do you plan to focus your social media marketing efforts in the next six months? What is your rationale? Tags Blog, Facebook, Forums, google+, Jon Loomer, LinkedIn, Mike Stelzner, Photo Sharing, Pinterest, Podcasting, Social Media Examiner, TUmblr, Twitter, YouTube. Bookmark the permalink. customers in ways your competitors aren’t even aware of. Interesting article Heidi! It goes to show that Google+ still has a way to go to convince people of its effectiveness for their business. For SEO’s there’s a clear benefit however for end users i think there needs to be some convincing. Interesting to see the continuous growth of all parts of social media as a commercial platform. Clearly not good news for the people that think it is all a hype!